I’m not as good as I’m going to get, but at least I’m better than I used to be. Surprisingly no rain fall in my area (as predicted), but it was quite chilly. So after running a few errands I stayed inside for the most part. My family and I are preparing for the San Diego Kidney Walk this Saturday. And I've been told at least, yes at least 11 of my family members will be flying down from NEW YORK to participate. YAY. I'm not clear on how everything is going to work out, but I do know that this weekend will be filled with food, fun and laughter! lol....gotta luv family!! Enjoy the day! 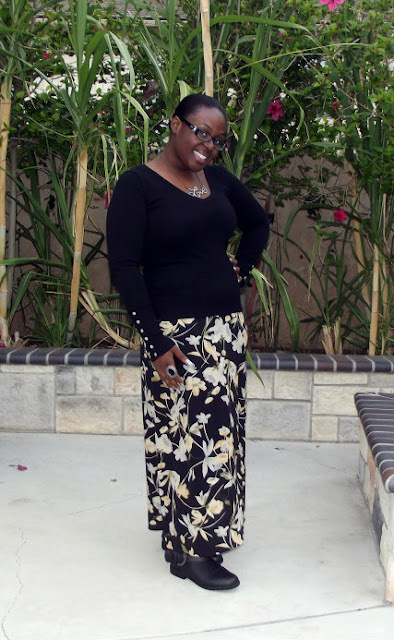 OUTFIT OF THE DAY: I love Rachel's style because she doesn't limit herself to just one. She goes from chic to rocker to classy, all of the above and she works it. 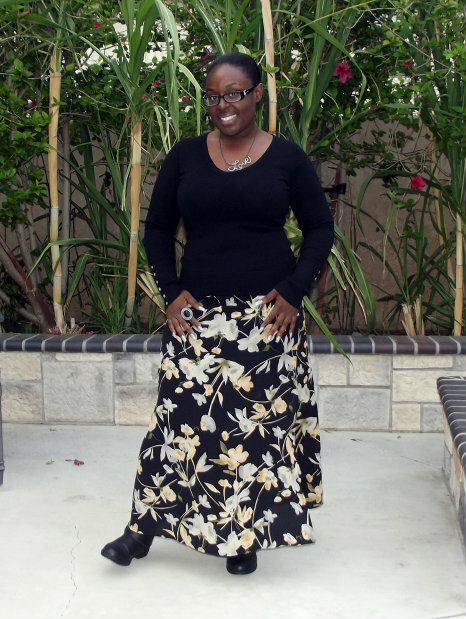 So Today I decided to try her maxi skirt look. Since today was pretty chilly, this outfit was perfect to keep me warm but not hot. Rachel took her flowy, floral maxi skirt and paired it with some leather motorcycle boots and a chunky black sweater for a seriously cool look. 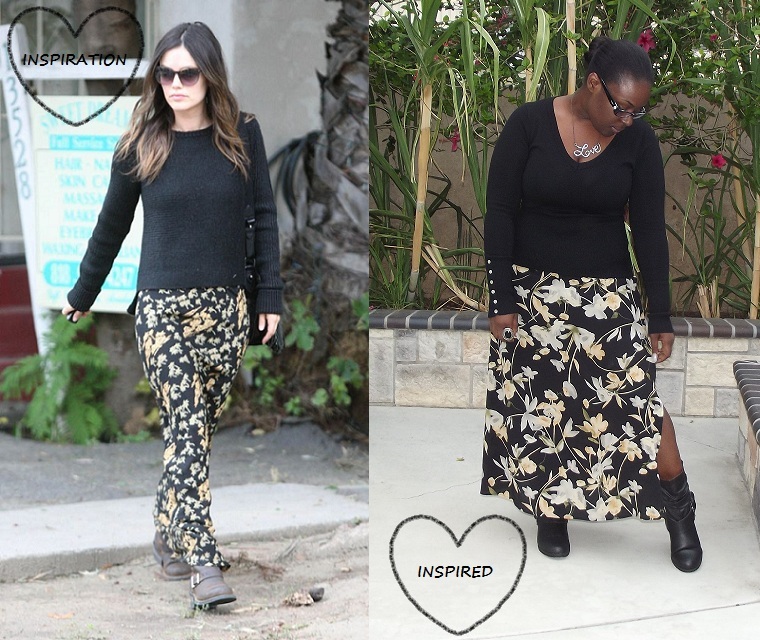 To duplicate, I started with a floral maxi skirt in dark, wintery hues (which looks similar to Rachel's). Next I added simple accessories for a casual look: Love necklace from torrid, a cocktail ring from Charlotte Russe and a satchel purse (not pictured--sorry) to finish the ensemble. Enjoy! Awe thank you sooo much!! Good inspiration outfit! I think I like your look better...the black boots really add a bit more edginess! why thank you! and yes they do!! hey hu, thanks for stopping by my blog and leaving a wonderful comment. Next time you should come and follow my page! Awe tyty. I am on my way as I type LOL!! 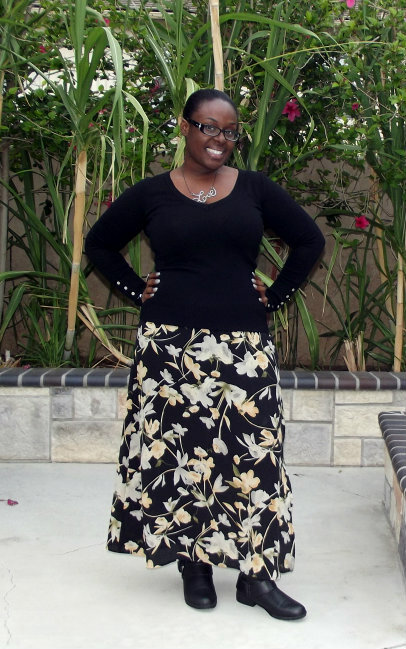 oh wow this floral skirt is sooooo amazing! You definitely rocking the look - love the edginess vibe. 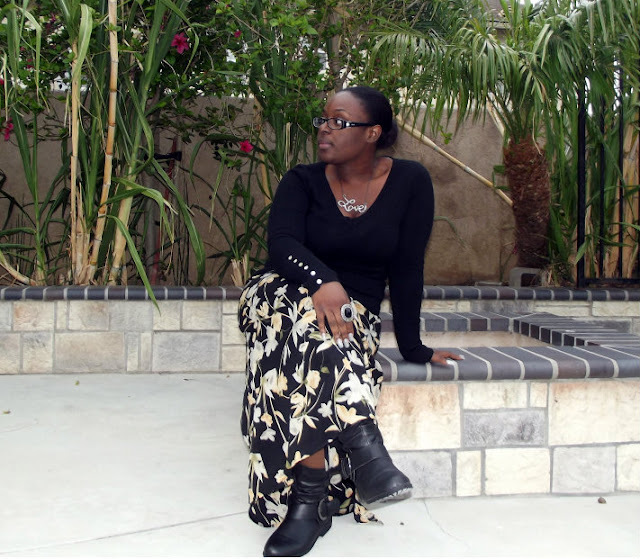 amazing blog!! !keep posting!! !can we follow each other? Yea definitely!! And thank you!